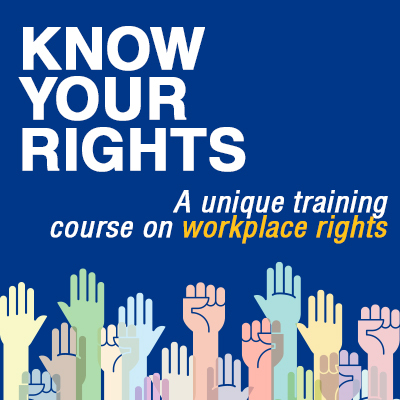 The Know Your Rights Workshop is one of Canada's longest-running education and outreach program for young workers. With one of the youngest memberships amongst unions in Canada, UFCW Canada is fully committed to helping young workers to protect themselves at work by gaining a solid understanding of their labour and employment rights. This workshop is presented to students in senior high school classes as well as colleges and universities, presenting them with practical information about their rights at work, the history of the labour movement and how to stay safe on the job. For almost a decade, UFCW Canada representatives and member activists have presented these workshops in a fun and interactive way to young workers about workplace issues that resonates with students and creates a comfortable, non-judgmental learning environment. Human Rights: From understanding the plight of migrant workers to confronting harassment and racism on the job, students learn more about the need for Human Rights here in Canada. Employment Standards: All students benefit from knowing there are laws about minimum wage, work hours, overtime, vacation and terminations. Labour Rights: Freedom of association is part of Canada's charter of rights from which students learn how workers can bargain collectively to combine their power to improve their lives. Health & Safety: All workers, young and old, need to know they have the right to know about workplace hazards, the right to participate in reducing workplace risks and the right to refuse unsafe work.